What is Core Decompression for Avascular Necrosis of the Hip? Core decompression is done under spinal or general anesthesia. The patient is placed on their back in supine position. Live X-ray imaging or fluoroscopy is used to guide your surgeon during the procedure. 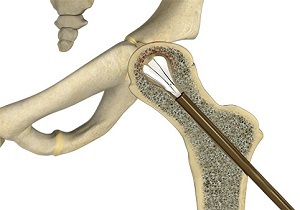 A small incision is made on your hip and a guide wire is passed from the incision through the neck of the femoral bone to the necrotic area in the femoral head. A hole is then drilled along the wire and the necrotic bone is then removed. This reduces the pressure immediately and creates space for the new blood vessels to grow and nourish the existing bone. The cavity that is left behind in the bone is sometimes filled with bone graft taken either from another part of your body or a donor. Sometimes synthetic bone graft material is used. The incision is then closed with sutures. Another variation of the same surgery involves drilling very small diameter holes from a single point. The surgical wound in this case is very small and may require only a single suture.